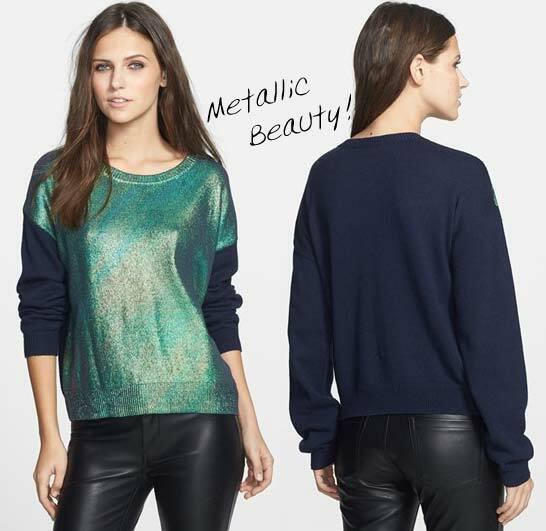 This Metallic Front Pullover by Leith has a shiny, iridescent finish that brightens the front of this trendy, eye-catching sweater. This Max & Mia ‘Big Dot’ Sweater has cool oversized polka dots that punch up this long-sleeve pullover. The sweater has a slightly scooped neckline for easy layering. The polka dots are just the right size and not too busy looking. This Milly ‘Marilyn’ Intarsia Sweater has a very flirtatious color blocking that mimics a sweetheart bodice and opera-length gloves. It is on a cashmere-softened crewneck sweater. This is that hard to find combination at this time of year. How to stay warm and still look wonderfully delicious…this is it!!!! This Sweater is truly adorable with a perfect fit for your wardrobe.